Smooth sultry summer grooves drift out of the Channel One Studio into master to saturate our souls. 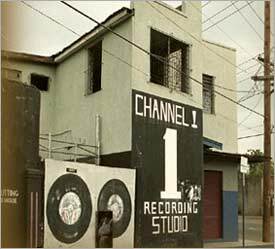 While not as well known as studios like Studio One or Treasure Isle, Channel One significantly molded the shape of reggae in the 70s and 80s under the management of Chinese-Jamaican Joe Joe and Ernest Hookim. Started in the Hookim home in downtown Kingston in 1974 after their jukebox business went under, Channel One hit it big with the Mighty Diamonds track ‘Right Time’. Alongside studio drummer Sly Dunbar’s signature double drumming they collectively pushed reggae back to a more roots sound with the militant rockers style, especially with house band Revolutionaries. In the 80s Channel One helped streamline the dancehall style with the help of house band Roots Radics. This CD tracks the evolution of Channel One sounds with classic names like Dillinger, Clint Eastwood, Barrington Levy, Yellowman, Delroy Wilson and many others. Throw this on and get lit letting the sun rays lick your face.